PURCHASED USED FROM PENN HILLS STATION 227 IN 2010. SEATING FOR A CREW OF UP TO 8, FIRST DUE ENGINE TO IN-DISTRICT STRUCTURAL AND VEHICULAR FIRES. 1981/2005 REFURB AMERICAN LAFRANCE RESCUE-PUMPERSEATING FOR A CREW OF 6, SECOND DUE ENGINE TO ALL FIRES AND RESCUE INCIDENTS & SERVES AS A RESERVE ENGINE. PURCHASED USED FROM CHURCHILL BOROUGH STATION 122. SEATING FOR A CREW OF 3, FIRST DUE TO ALL RESCUE ASSIGNMENTS & ANY 2ND-WORKING QRS/MEDICAL CALLS. RETIRED PENN HILLS POLICE UNIT. RESPONDS TO MEDICAL CALL REQUESTS. PURCHASED NEW WITH THE ASSISTANCE OF THE PA DEPT OF FORESTRY GRANT. RESPONDS TO ROUGH-TERRAIN FIRE & RESCUE INCIDENTS. RESPONDS TO WATER-RESCUE INCIDENTS ALONG THE ALLEGHENY RIVER, ALONG WITH 285-BOAT (VERONA), 111-BOAT (BLAWNOX) AND/OR 216-BOAT (OAKMONT). RETIRED OHIO STATE PATROL VEHICLE. RESPONDS TYPICALLY WITH SUPPLEMENTAL MANPOWER TO SCENES. 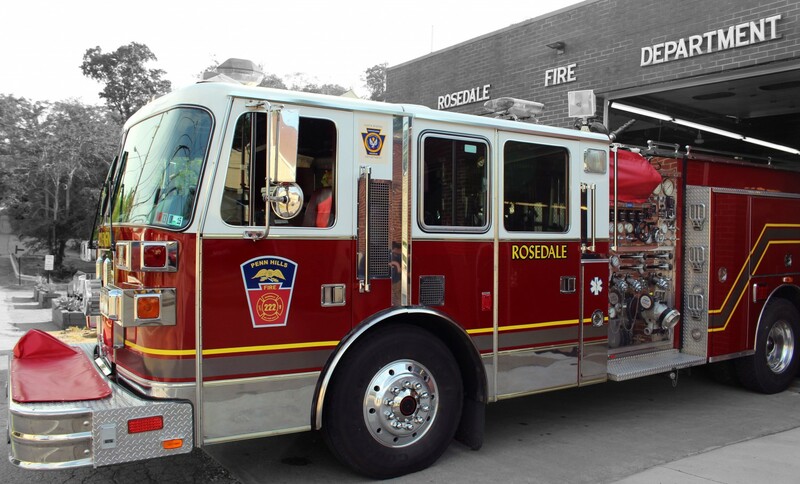 PHOTOS: ROSEDALE HAS BEEN FORTUNATE TO HAVE A WELL-DOCUMENTED PHOTO LIBRARY FROM OVER THE YEARS – OF COURSE, WE COULDN’T DOCUMENT IT ALL, ESPECIALLY WHEN WE’RE “ON THE JOB,” AND WITH THAT, WE’D LIKE TO THANK OUR FRIENDS WESTERN PA FIRE PHOTOGRAPHY, PATRICK SHOOP JR (LEWISTOWN, PA), BILL WAUGAMANN (EX-RESIDENT/SAN DIEGO FIRE DEPT), AND ALL OF THE OTHERS WHO HAVE SHARED MOMENTS CAUGHT ON CAMERA WITH US. IF YOU HAVE ANY PHOTOS THAT YOU’D LIKE TO SHARE, PLEASE DO!